So, what does a good defined benefit transfer file look like? We’re asked this question frequently at Apricity and, as a company that is allergic to checklists, we didn’t want to just provide a list of things to tick off. We think it’s more important that there is a thorough understanding of the FCA requirements behind reviewing a defined benefit scheme, and this should lead to your files being, you guessed it… naturally compliant. 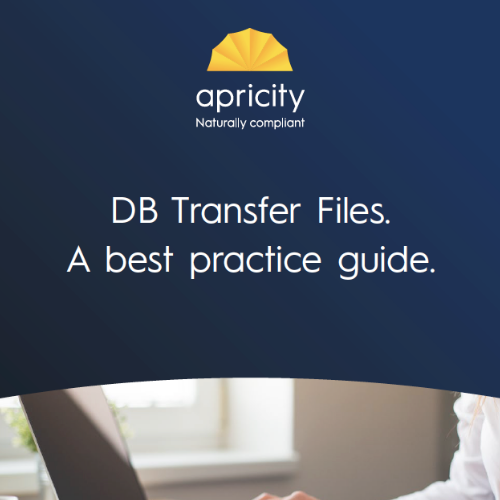 This report will look at the various components of a file that has recommended a defined benefit transfer, provide some pointers, and talk about what we would expect to see in an “ideal” case. Due to the timeliness of this paper, we have also included an additional element focused on the upcoming changes, in particular what we would like to see in a future file, factoring in the new APTA and TVC requirements. This paper will provide some context, ideas and guidance in, hopefully, plain English. We undertook a survey to find out the concerns people have in this area, and some of these results are summarised at the end. We’ve also aimed to cover specific issues advisers raised when undertaking the survey in here. So if there’s anything extra you’re unsure on, or anything that remains unclear, drop us a line! We love to talk. Check your emails – there’ll be an email from us with a link to download a PDF of the guide!